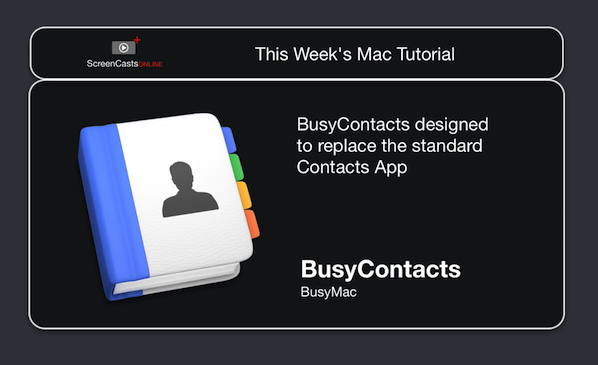 We're pleased to announce that ScreenCastsOnline has produced a BusyContacts video tutorial. The free 25-minute video provides an overview of several features in BusyContacts, including installation, setup, card view and list view, info panel, activity list, BusyCal inegration and more. ScreenCastsOnline produces top quality video tutorials of leading Mac and iOS applications. ScreenCastsOnline Membership includes new weekly Mac & iOS video tutorials via iTunes, full website access including the entire video archive of 500+ tutorials, plus a complimentary subscription to the ScreenCastsOnline Monthly magazine. Check out the free BusyContacts video tutorial on ScreenCastsOnline!